It's time for some real talk...I was actually really nervous when Melissa contacted me about being her newborn photographer...and I was even more nervous when I actually agreed to doing it! I've had experience with young children, but I have never done a true newborn session before. Melissa contacted me awhile back, knowing I didn't have experience in this area, but still wanted to be my guinea pig if I was up for it. I thought about telling her no, and referring her to a photographer more experienced in this area, but, since she was willing to give me a chance, I was like, "Well, why don't I give this a shot?" Guys, honestly, this is one of my most favorite shoots that I have done to date. I didn't know if I would enjoy it or not, but I am so grateful for Melissa giving me a chance to try this new area of photography and opening my eyes to something I never expected I would enjoy so much. 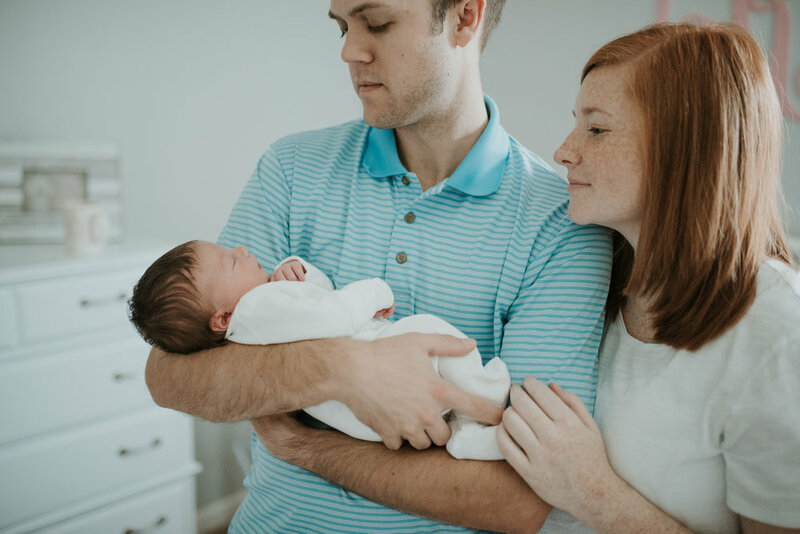 It is literally the coolest thing to do a lifestyle newborn session because you are being invited to share a few precious moments of probably the most monumental time in a couple's life. The parents are tired, happy, nervous, but totally and head-over-heels in love with their precious child. It is such an honor to be able to capture those emotions and memories in a still picture.